Once again, the NXT Superstars proved why they are the future of the industry as the took over the WWE Network (FREE for the month of May) with NXT TakeOver: Unstoppable! The action was as advertised, non stop as each match was a show stealing performance. Every title was defended and there were twists and turns and surprises and moments that left the NXT Universe in awe. If you haven’t seen it (what is wrong with you??) WATCH IT!!! But until then find out what happened here! If there was ever any doubt that Finn Balor has risen, it was shattered last night. His entrance alone had the NXT Universe chanting “this is awesome,” and “holy sh*t.” The Demon came to play with Tyler Breeze at Unstoppable. Prince Pretty however, was none too impressed with the spectacle his opponent put on and set to keep Balor grounded and prevent him from using the high flying offense that he is known for. This did not prevent Finn from taking control of the match as a double foot stomp to Breeze’s spin set the events in motion that would cost the mayor of Cuteville his match. The most spectacular moment (and that’s saying something given the Irish Demon’s entrance, seriously Unstoppable is worth it for his entrance alone) is when Finn Balor scaled the arena entrance way and pounced on Breeze. The action returned to the ring and Balor finished Tyler off with a Coup de Grace to earn the #1 Contendership to the NXT Championship yet another time. This match was but the beginning of a night of intense matches. The Tyler Breeze knew exactly what he had to do to control the match and it worked for a bit as he attempted to use submissions to wear down Finn. But the Demon came to play. Again I can not stress the entrance. Just O.M.G. Chills ran up and down my spine. The Demon has wings now! and an eye on its back. and dude… Yeah I’m still in awe over it. Just go watch it. That’s an order. The match it self was freaking off the charts fun. Both men delivered in ways that the NXT Universe was not expecting. And hey, Tyler throwing a bit of a b*tch fit in his frustration was just a giggle. As for Balor being the #1 contender. He’s gone down this road once before and lost. Hope he brings the demon to play next time against Kevin Owens. Otherwise, he will end up like anyone else who has gone against the NXT Champion. Four extremely talented NXT Women in a match together. How is that not a win win for all in attendance and watching at home. The question on everyone’s minds was, which of the two teams would work the best together? Turns out is was Charlotte and Bayley. While Emma and Dana did work well together, in the end it was the mutual respect of their opponents that won the evening. The Match itself was a constant back and forth wrestling gem. Dana and Emma controlled the match at the start isolating Bayley from the genetically superior diva. But once the opportunity to tag Charlotte in presented itself, Bayley made the tag and the former NXT Women’s champion owned her ring. She wore down both women on the opposite team and she and Bayley showed amazing communication skills as a team as the worked together to seal the win. A Bayley to belly suplex removed Dana from the picture and that allowed Charlotte to deliver a Natural Selection to Emma for the win. I’ve gushed about NXT Women’s wrestling on numerous occasions. Just when I think the main roster Diva’s are starting to reach a level akin to the NXT women, these ladies have a match like this that blows anything coming from the main roster away. I know that things are only beginning between Charlotte and Dana Brooke. And the Tension between Emma and Bayley is still very much alive. Both these budding rivalries have only begun. Bayley and Charlotte may have won this battle, but the war is FAR from decided. This match was exactly what I hoped it would be. If you wanted a technical wrestling clinic like the first two matches, you didn’t get it. If you wanted an all out spine tingling brawl? Yep that is what you got. Rhyno and Baron Corbin tore the house down. No one has ever man handled NXT’s Lone Wolf the way the Man Beast did. Corbin was tossed around like he weighed nothing, but he brought the fight right back to Rhyno and made him earn everything he threw at the force of nature that is Baron Corbin. Rhyno was able to hit the belly to belly suplex that sets up his Gore, but he was not able to land the devastating spear as Corbin countered with a clothesline and then landed the End of Days on the former ECW champion to pick up the win. This match just made you cringe with the amount of power being thrown around. As stated above, never before have I seen Baron Corbin thrown around or man handled as if he were a nothing. The power of Rhyno is off the charts. I would honestly love to see these two go at it again. It was so much fun the first time. Perhaps with Baron knowing exactly what he is getting into it would be less on sided. And it was one sided there for half the match. But on the flip side, Rhyno would also know he would have to step up his game and expect the unexpected when dealing with Corbin. He has proven that while you can beat him down, he also has the ability to rally back and strike when you least expect it. Blake and Murphy were not expecting the fight that they got with Enzo and Big Cass. How do I know? Because they nearly lost their titles on numerous occasions. Enzo exploded into the match like a man on a mission as he attacked more aggressively than the NXT Universe is used to seeing from the bonafide stud. However, the NXT Champions weathered the storm and battled back and double teamed Enzo to knock the wind from his sails. It appeared to become a desperate situation, but then Big Cas got the tag and offensive momentum was once again in the 7 footer and his little buddy’s corner. Cass gave a Big boot to both champions and used his size and power to firmly control the match. But the end came when he tagged in Enzo who was still dazed from the beating he received before tagging in Cass. As Cass was setting up their double team move that won them many matches in the past, he became distracted when Alexa Bliss ran down to the ring and attacked Carmella. This distraction allowed the NXT Tag Champions to finish the job on Enzo and pin him for the win. NXT Tag Team fun! At no point in this match was I disappointed. Hell, even the end was a blast as it sets up a potentially amazing feud between Carmella and the princess of sparkle. And hey I gotta say I’m looking forward to the inevitable 6 person tag matches that will ensue because of this. This rivalry is so not over and i know that Enzo and Cas will continue to go after the Championships. Though I would like to see the Vaudvillians enter the fray for these titles as well. They would add an element that would keep this division from getting stale. This match stole the night. Not even the coming main event could touch what this match delivered. Sasha Banks and Becky Lynch battled for supremacy in a war that became personal in the last few weeks. These former Team B.A.E members know each other so well that there was no way they were going to make it easy for the other. Becky came out strong and had the champ on the defensive. She kept trying to lock in the arm bar that had forced the Boss to tap at the contract signing but Banks narrowly avoided it. They both proved to be masters of their craft as each woman did eventually lock in submissions, but both women also showed super natural resilience as they either forced the other to break or they were able to make it to the ropes. The grappling was second to none and there was no shortness in high risk offense or technical wrestling ability. Both women were evenly matched and it could have gone to either of them. It came down to who would be able to lock in the right move at the right time. The answer came in the form of Sasha countering a top rope maneuver and locking Lynch in the Bank Statement to retain her title. This match was by far the best of the night. It was more main event caliber than the main event. There was so much passion and hunger in both women that you stayed locked into the story they told in the ring. The chemistry between Becky and Sasha is lightning in a bottle good and it would be a travesty if this was their only time to face off. Sami Zayn was a force to be reckoned with and Kevin Owens was woefully unprepared for the intensity of aggression that he received in his challenger. Owens attempted to start the match as has become his custom. Slide out to take the steam from his opponet’s attack. But similar to last time they faced off, Sami took the fight to the champion and this time did not let up in his attack. 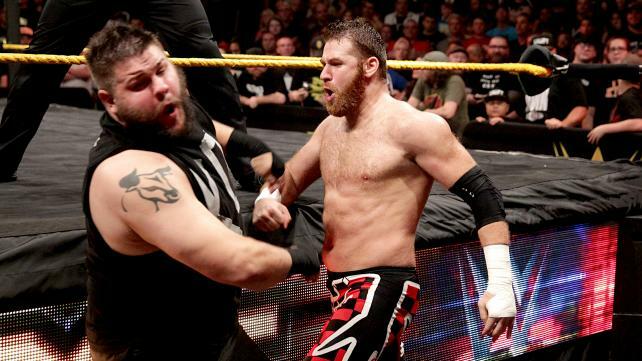 In a brawl that made its way into the NXT Universe Sami controlled the match and brought it back to the ring. Kevin was able to fight back and gain control briefly before Zayn caught him with an exploder suplex to set him up for the Helluva kick. Before the kick that won Sami the NXT Championship could connect, Kevin rolled from the ring. Once again, Sami followed and caught him again with the same suplex. As he again made to deliver the kick on the outside though, Owens caught him with a pop up powerbomb to the ring apron. The very same move that took Sami out for 2 months. And like last time, the move destroyed Sami Zayn. He was done. But that did not prevent the champion from attempting to finish the job as he constantly brutalized the down challenger. No amount of officials or referees could keep Kevin Owens from inflicting punishment on a defenseless Zayn. Not even William Regal himself could deter Owens from his mission to destroy Sami. The NXT General Manager caught a vicious head but for his troubles. So who could end this attack? 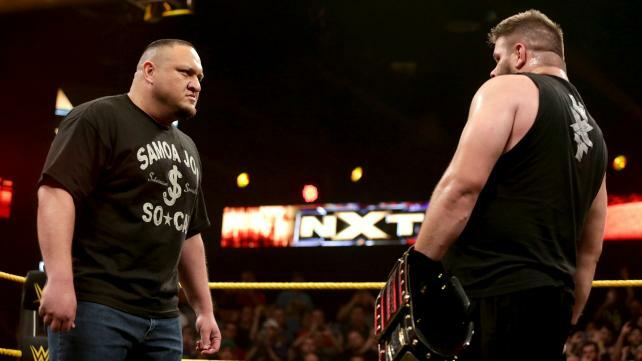 Enter Samoa Joe… Yes you read that right. His mere presence in the ring back the NXT Champion down. Kevin backed down, went to the back, But he came back, why? good question but it was clear the NXT Champion wanted none of the large, highly anticipated wrestler in the ring who had come to Sami’s aid, and he retreated once more. This entry was posted on Thursday, May 21st, 2015 at 2:00 pm	and is filed under Events, News, Television. You can follow any responses to this entry through the RSS 2.0 feed. You can skip to the end and leave a response. Pinging is currently not allowed.